Humanity’s difficulties dealing with climate change trace back to a simple fact: We are animals. Our cognitive and limbic systems were shaped by evolution to heed threats and rewards close by, involving faces and teeth. That’s how we survived. Those systems were not shaped to heed, much less emotionally respond to, faceless threats distant in time and space — like, say, climate change. No evil genius could design a problem less likely to grab our attention. 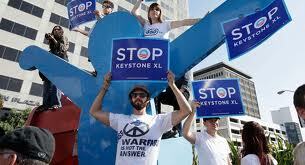 Keystone Protesters – the New Town Criers?